Anterior bite opening entails loss of tooth contacts and decreased overbite, causing a deterioration of the occlusion, chewing difficulties, speech difficulties, a changed appearance and a lower bite force than normal . Anterior bite opening after completed growth, can occur due to degenerative changes of the temporomandibular joint (TMJ) caused by systemic rheumatic diseases or osteoarthrosis, resulting in posterior rotation of the mandible . Mandibular condylar fractures , growth hormone disturbances, tumors in the jaws  and relapses after orthodontic treatment may also cause bite opening. Macroglossia can affect the jaws and result in an open bite , but after a surgical reduction of the tongue, the occlusion was found to improve . In adults with muscular dystrophy, a neuromuscular disease, anterior bite opening commonly develops . However; sometimes it is not possible to identify a cause of the adult bite opening, and the prevalence of idiopathic bite opening is not known. The position of the teeth is influenced by forces from the lips, cheeks and tongue, and parafunctional behavior, like tongue thrusting and lip-biting, may affect the occlusion . A complication of periodontitis is tooth migration and the periodontal inflammation facilitate occlusal changes from oral habits . Among adults, the impact of oral forces on the occlusion is sparsely studied. Tongue thrusting has been discussed as a cause of anterior bite opening in case reports [10, 11]. Mouth breathing and juvenile swallowing patterns are other factors discussed as possible causes [8, 12]. The development of bite opening in adults with muscle dystrophy indicates the importance of muscle activity for the oral morphology . The prevalence of TMD symptoms among adults requiring treatment has been estimated to 5-16% with higher values for women [13, 14]. In children and adolescents, especially in girls, an open bite has been associated with an increased risk of TMD , but which has not been investigated in adults. It is not known if there is an association between the bite opening and orofacial pain and dysfunction. No reports on the prevalence of anterior bite opening in adulthood were found in the literature. The aim of this study is to investigate the prevalence and types of anterior bite opening of unknown cause in adults referred to specialist clinic, the symptoms of TMD among these patients, and to identify possible causes of anterior bite opening in adulthood. During a two-year period, all newly referred patients to the Orofacial Pain and TMD Clinics, Public Dental Health Service in Gothenburg and Borås, Sweden, 20 years of age or older and with a subjective report of anterior bite opening presenting in adulthood were considered for a clinical observation study. An anterior bite opening was defined as a recent loss of anterior tooth contacts and reduced overbite, and confirmed by earlier patient records, available models, panoramic radiographs and cephalomteric radiographs, photos of the occlusion at the patient´s general practitioner, earlier photos of the patient’s facial appearance, and facets on incisors/canines that could not be reached with the current occlusion. Patients with TMJ arthrosis, systemic rheumatic diseases, neuromuscular diseases, previous fractures of the jaws and recent prosthetic or orthodontic treatment, were excluded in order to get a group of patients with no known cause of the bite opening. During a two-year period, 1889 new consecutive patients (≥ 20 years old) were examined at the two clinics, and of those, 34 patients matched the inclusion criteria. Four of these patients were excluded after the TMJ radiography due to degenerative joint changes, not suspected from the clinical examination. Informed consent to participate was obtained from each patient, one patient rejected inclusion and 29 patients were included in the study. The reason for referral was occlusal problems in 52%, and occlusal problems and pain in 48%. The patients first completed a standardized questionnaire in accordance with the Diagnostic Criteria for Temporomandibular Disorders (DC/TMD)  and regarding their general health. In order to catch information about circumstances able to give a bite opening, the patient’s history was supplemented by an interview regarding the bite opening, any previous orthodontic or prosthodontic treatment and a medical history. The patients classified the degree of their current reported symptoms (Si) on a verbal five-point scale (1 = no/minimal, 2 = light, 3 = moderate, 4 = fairly severe, 5 = severe symptoms ). Unfortunately, there was a delay of 6-12 months from the referral until the examinations due to a large number of referrals. A clinical examinations according to the DC/TMD  was performed and with an extension for the occlusion , the same examiner for all the patients. The examiner was used to and trained with the DC/TMD examination, and the diagnosis of TMD was stated according the DC/TMD. Clinical signs of parafunctional behavior, and the appearance and location of mucosal impressions from the teeth on the cheeks, lips and tongue, were noted. Impressions on the upper surface of the tongue from the occluding teeth was regarded a sign of tongue pressure in between the dental aches. According to the information gained from the patient’s history, previous occlusion and appearance, and present signs of parafunction, a possible association with the bite opening was suggested for each patient. Occlusal contacts were recorded in the maximum intercuspal position (ICP), tooth by tooth of the maxilla by using a plastic colored foil (Trollfoil, Troll Dental, 8μm) attached to a Miller articulating forceps tweezers. The opening width, defined as the number of teeth in a row without an occluding contact, was measured for each patient. The maxillary dental arch width was measured according to Kiliaridis et al., 2003 . For patients using a splint, the present and former splints were examined with regard to type, occlusal coverage and contacts. Radiographic examination of the TMJ was performed with cone beam computed tomography (CBCT) according to the routine at the clinics for investigating occlusal changes. Only patients with normal TMJs were included in the study to ensure a group of patients without a known possible cause of the anterior bite opening. Dentofacial morphology was assessed on digital lateral radiographs taken in central occlusion. The radiographs were traced using a cephalometric software (FACAD, Illexis AB, Linköping, Sweden). Measurement points and reference lines defined by Bjork  are shown in Fig. (1). The questionnaire and the examinations followed the routines at the clinics´ for investigation of patient´s occlusal changes. Informed consent to participate in the study was obtained from each patient and the guidelines of the Helsinki Declaration have been followed. The study was discussed with the Ethical Committee at the University of Gothenburg, and according to their written policy for this type of studies, no more ethical approval was required. The statistical analyses were performed by using the IBM SPSS Statistics 22 software (SPSS Inc., Chicago, Il). For the analysis of differences between the groups, Studentʼs t-test and the Mann-Whitney U-test were used, with the p-value < .05 for statistical significance. As there are only few patients with anterior bite opening, and no previous study of adult bite opening was found, there was no power analysis performed and the study could be regarded as a pilot study to get some information of these patients. The prevalence among referred patients of recent anterior bite opening in adulthood was 1.6%. The patients (23 women and 6 men) were aged 21-71 years (= 36.2, SD 12.1). The degree of bite opening varied, and the over bite ranged from +1.5 to -4 mm. For the whole group, the mean number of occluding pairs of teeth in ICP was 3.7 (SD ±1.5), the mean opening width was 11 teeth in a row without occlusal contact (SD ±2.2), and the mean dental arch width was 32.8 mm (SD ± 2.98). The patients’ occlusion is presented in Table 1. 26* 27 -1.0 I ● ● ● ○ ○ ○ ○ ○ ○ ○ ○ ○ ○ ● ● ● 34.0 Breathing diff. 27* 34 -1.0 I ● ○ ○ ○ ○ ○ ○ ○ ○ ○ ○ ○ ○ ● 30.0 Breathing diff. 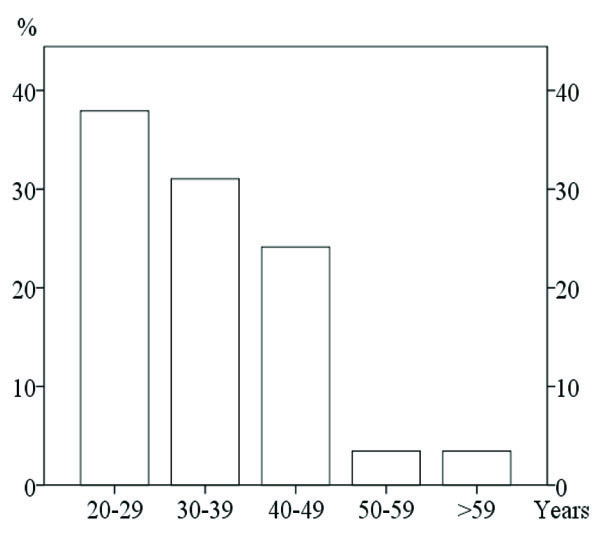 The bite opening had developed after the age of 30 in 62% of the patients (Fig. 2) and had started less than three years before the examination in 69%. In most patients, the bite opening had developed slowly. A cephalometric analysis was performed in 21 patients (Table 2). Some structures were however, not visible in all radiographs which explain the smaller number of patients (n) for some variables. The cephalometric values were considered to be within a normal range except the maxillary plane (NSL/NL angle) which on average was 5.2 degrees (SD= 2.2), implying that the maxilla was more anterior rotated compared to a normal group . Symptoms of pain and dysfunction of the jaws and head once a week or more often, were reported by 62% for tiredness and/or orofacial pain, 41% for headache, 24% for clicking, 3% for difficulty opening wide, and 41% for sensitive/tender teeth. Parafunction or bruxism was reported by 2/3 of the patients and only four denied such activity. According to the subjective index, 62% of the patients evaluated their symptoms as moderate to severe. A previous period in life of TMD symptoms or treatment of bruxism before the bite opening, was reported by 66%. Muscle tenderness on palpation was the most common clinical finding, with 79% of the patients fulfilling the criteria for myalgia. Headache associated with TMD was diagnosed in 41% and arthralgia in two patients (7%). TMJ disc displacement was diagnosed in nine patients, but only one patient had current symptoms other than the sound. The mean maximum mouth opening capacity was 53 mm (37-68), only one was regarded impaired. All patients but one had some type of dental impression on the tongue, lips and/or buccal mucosa. Seven of the patients (24%) used, or had been using, a splint not covering the last upper molars. Four patients (14%) reported that the bite opening had started during pregnancy, and associated with body edema and breathing difficulties for two of them. The other 18 patients (62%) all had tongue impressions of the type assumed to indicate a habit of keeping/pressing the tongue between the dental arches. A significant difference (p = 0.008) was noticed for the occlusal opening width between the group of possible tongue pressure (mean 10.3 teeth in a row, SD ±2.1) and the group of a use of a partial splint (mean 12.6 teeth, SD ± 1.2). Six patients (34%) in the group of possible tongue pressure had a cross bite, while none of the patients with the other suggested causes. There was no significant difference between the different possible causes and the symptoms of TMD, dental arch width, cephalometric values, age or gender. A prevalence of 1.6% of anterior bite opening of unknown cause was found among the adult patients referred to the two Orofacial pain and TMD Clinics. There are probably more hidden cases of anterior bite opening in adulthood in the population, and those without pain may not be discovered. The confirmation of a recent bite opening was based on a combination of factors indicating the change of occlusion, besides the information from the patient about a loss of tooth contacts and the ability to bite off at the front teeth, which ensures that the study comprises patients with a bite opening presenting after the growth had been completed. In order to ensure a group of patients without a known cause of the bite opening, patients with a rheumatic or neuromuscular disease, and TMJ osteoarthrosis were not included as the bite opening could be a result of the disease. However, degenerative changes or remodeling of the TMJ could also be a consequence of an altered loading of the TMJs and loss of occlusal contacts due to a bite opening . Fig. (1). Cephalometric landmarks and lines. The development of an anterior open bite could be explained by over-eruption of the last molars as due to a splint not covering those teeth. Another possible cause is a tongue pressure between the mandible and maxillary arches when the tongue covers most of the occlusal surfaces but not reaches the posterior molars, and giving the last molars a possibility to over erupt . A changed tongue behavior could originate from protecting a tender tooth, or maybe from a dentist’s remark about attrition and the patient´s desire to protect the teeth from non-functional biting. The fact that the maxilla was more anteriorly rotated in most of the cases might even implicate that the tongue pressure could initiate a skeletal change as part cause to the anterior bite opening. Cross-bites were more often found in the group of suspected tongue pressure, and the absence of a tongue position in the palate could influence the morphology of the maxilla and the development of a cross bite. Myalgia and headache associated with TMD were frequently diagnosed, and a majority of the patients had previous periods in life of TMD symptoms. This indicates an association between muscle tension and the development of a bite opening. Facets on incisors and canines were clinical signs that confirmed previous occlusal contacts, but this could also indicate a previous bruxing behavior. A non-functional muscle activity of bruxism had changed towards a more tongue- and lip-pressing behavior causing the bite opening. Fig. (2). The patients age at start of the anterior bite opening. A bite opening leads to an open bite, which is a malocclusion that may lead to neuromuscular changes . It is not possible to say whether the TMD symptoms among the patients of the study, are associated with the impaired occlusion following the bite opening, or if both the TMD symptoms and the occlusal changes are results of an increased or altered parafunctional activity. Sensitive or tender teeth were reported by 41% of the patients, which could relate to the distribution of the occluding forces across fewer teeth than normally. However, bruxism and parafunctional activity could also give both myalgia and hypersensitive teeth. The study shows that the occlusion can easily be altered in adults by a splint with partial extension, but factors influencing the occlusion in adulthood are not fully known. However, a patient should not be left with a split for a longer period of time without check-ups. Tooth migration is associated by gingival inflammation , and during pregnancy there was a significant increase of the gingival inflammation in healthy women . Three patients of the study noticed the start of their bite opening during pregnancy and another patient (nr 8) had jaw problems during her pregnancy but could not remember if her bite opening stated during or after the pregnancy. Two of these women complained of body edema and breathing difficulties during pregnancy. Anterior bite opening can occur in adulthood without organic or systemic disease of the TMJs or masticatory muscles, and was frequently associated with muscle symptoms. A majority of the patients had previous periods of TMD symptoms before the bite opening started. A partial splint and oral parafunctional activity is a possible cause of anterior bite opening after complete growth. The study was discussed with the Ethical Committee at the University of Gothenburg, and according to their written policy for this type of studies, no more ethical approval was required. The authors declare they have no conflicts of interest. The authors declare that they received no funding to perform the investigation, and have no financial interest in or benefits of the study. Miyawaki S, Araki Y, Tanimoto Y, et al. Occlusal force and condylar motion in patients with anterior open bite. J Dent Res 2005; 84(2): 133-7. Nordahl S, Alstergren P, Appelgren A, Appelgren B, Eliasson S, Kopp S. Pain, tenderness, mandibular mobility, and anterior open bite in relation to radiographic erosions in temporomandibular joint disease. Acta Odontol Scand 1997; 55(1): 18-22. Yanagita T, Adachi R, Kamioka H, Yamashiro T. Severe open bite due to traumatic condylar fractures treated nonsurgically with implanted miniscrew anchorage. Am J Orthod Dentofacial Orthop 2013; 143(4)(Suppl. ): S137-47. White SC, Pharoah MJ. Oral radiology: principles and interpretation 6th ed. 2009. Farronato G, Salvadori S, Giannini L, Maspero C. Congenital macroglossia: Surgical and orthodontic management. Prog Orthod 2012; 13(1): 92-8. Hotokezaka H, Matsuo T, Nakagawa M, Mizuno A, Kobayashi K. Severe dental open bite malocclusion with tongue reduction after orthodontic treatment. Angle Orthod 2001; 71(3): 228-36. Kiliaridis S, Mejersjö C, Thilander B. Muscle function and craniofacial morphology: A clinical study in patients with myotonic dystrophy. Eur J Orthod 1989; 11(2): 131-8. Proffit WR. Equilibrium theory revisited: Factors influencing position of the teeth. Angle Orthod 1978; 48(3): 175-86. Brunsvold MA. Pathologic tooth migration. J Periodontol 2005; 76(6): 859-66. Yamada K, Satou Y, Hanada K, Hayashi T, Ito J. A case of anterior open bite developing during adolescence. J Orthod 2001; 28(1): 19-24. 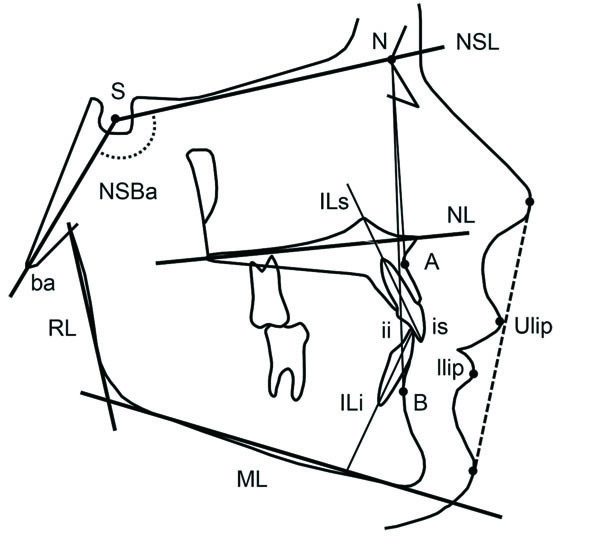 Bosio JA, Justus R. Treatment and retreatment of a patient with a severe anterior open bite. Am J Orthod Dentofacial Orthop 2013; 144(4): 594-606. Yamaguchi H, Sueishi K. Malocclusion associated with abnormal posture. Bull Tokyo Dent Coll 2003; 44(2): 43-54. Visscher CM, Ligthart L, Schuller AA, et al. Comorbid disorders and sociodemographic variables in temporomandibular pain in the general Dutch population. J Oral Facial Pain Headache 2015; 29(1): 51-9. Al-Jundi MA, John MT, Setz JM, Szentpétery A, Kuss O. Meta-analysis of treatment need for temporomandibular disorders in adult nonpatients. J Orofac Pain 2008; 22(2): 97-107. Schiffman E, Ohrbach R, Truelove E, et al. Diagnostic criteria for temporomandibular disorders (DC/TMD) for clinical and research applications: recommendations of the international RDC/TMD consortium network* and orofacial pain special interest group. J Oral Facial Pain Headache 2014; 28(1): 6-27. Magnusson T, List T, Helkimo M. Self-assessment of pain and discomfort in patients with temporomandibular disorders: A comparison of five different scales with respect to their precision and sensitivity as well as their capacity to register memory of pain and discomfort. J Oral Rehabil 1995; 22(8): 549-56. Carlsson G, Magnusson T. Management of temporomandibular disorders in the general dental practice 1999; 75-7. Kiliaridis S, Georgiakaki I, Katsaros C. Masseter muscle thickness and maxillary dental arch width. Eur J Orthod 2003; 25(3): 259-63. Björk A. The face in profile. An anthropological X-ray investigation on Swedish children and conscripts Sv Tandlak Tidskr 1947. (Suppl 5B). Kuang B, Dai J, Wang QY, et al. Combined degenerative and regenerative remodeling responses of the mandibular condyle to experimentally induced disordered occlusion. Am J Orthod Dentofacial Orthop 2013; 143(1): 69-76. Lindskog-Stokland B, Hansen K, Tomasi C, Hakeberg M, Wennström JL. Changes in molar position associated with missing opposed and/or adjacent tooth: A 12-year study in women. J Oral Rehabil 2012; 39(2): 136-43. Uslu O, Arat ZM, Beyazoya M, Taskiran OO. Muscular response to functional treatment of skeletal open-bite and deep-bite cases: An electromyographic study. World J Orthod 2010; 11(4): e85-93. Martinez-Canut P, Carrasquer A, Magán R, Lorca A. A study on factors associated with pathologic tooth migration. J Clin Periodontol 1997; 24(7): 492-7. Figuero E, Carrillo-de-Albornoz A, Martín C, Tobías A, Herrera D. Effect of pregnancy on gingival inflammation in systemically healthy women: A systematic review. J Clin Periodontol 2013; 40(5): 457-73.